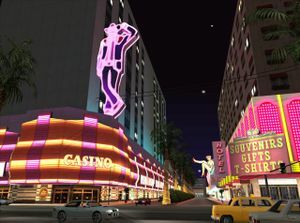 The Old Venturas Strip is a district in Las Venturas, which appears in Grand Theft Auto: San Andreas. It houses all of the older and original casinos and is only a short drive away from The Strip. To the west is Redsands East, The Strip and Starfish Casino, while to the east is Julius Thruway East and Creek. To the north is Roca Escalante, while to the south is Pilgrim and The Clown's Pocket. Here, protagonist Carl Johnson can buy a hotel suite for $6,000. The district is based on Las Vegas's Fremont Street. A casino in the Old Venturas Strip is the setting for the Venturas Poker Challenge TV Show in Grand Theft Auto IV. The Old Venturas Strip Safehouse. A map of the Old Venturas Strip. This page was last modified on 25 February 2012, at 11:48.